Axel Filges speaks on German legal market, proficiency standards | Russian Legal Information Agency (RAPSI). 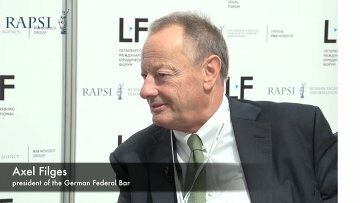 Axel Filges, president of the German Federal Bar, visited RAPSI’s open studio at the St. Petersburg International Legal Forum to speak about the local legal market, specific features of the monopoly on providing legal services and proficiency-based education. “Without a doubt, the legal services market in Germany is quite saturated. If we think in terms of the fact that there are some 164,000 lawyers in a country with a population of 80 million - this is clearly a lot [of lawyers]. As far as [the ratio of lawyers to members of the general population] goes, I think Germany ranks first in Europe,” Filges said. This heightens the level of competition in the market, but a qualified lawyer wouldn’t be left without a job especially taking into account strengthening of the role of the law in everyday life, he added. By now, in Germany practically everyone understands that they have rights they should be able to defend. Nevertheless, there has been an ongoing debate in Germany about whether or not to limit the number of lawyers admitted each year to practice law. A key argument against this is the 12th article of the German Constitution, which stipulates that every citizen has a right to freely choose his or her profession, according to Filges. “In my opinion, it would be wrong and unwise to introduce arbitrary limitations, because the market needs healthy competition, and those who are well versed in their field and who satisfy their clients should succeed,” Filges said. At the same time, professional community needs to be protected from competition with those that don't meet the high educational standards and quality of service, which is the essence of the monopoly on providing legal services, according to Filges. He noted that legal profession has changed significantly in terms of educational standards. "In my day, simply passing the exam was enough. By now, we have added a number of additional criteria: knowledge of foreign languages, experience living abroad, degrees obtained abroad - all of these things matter," Filges said. Besides, those students who opt early for certain law specializations have better chances of getting a job as the German legal market is becoming more and more specialized.